In addition to not being ready to pack away my camo quite yet, I feel the same way about my faux leather leggings! 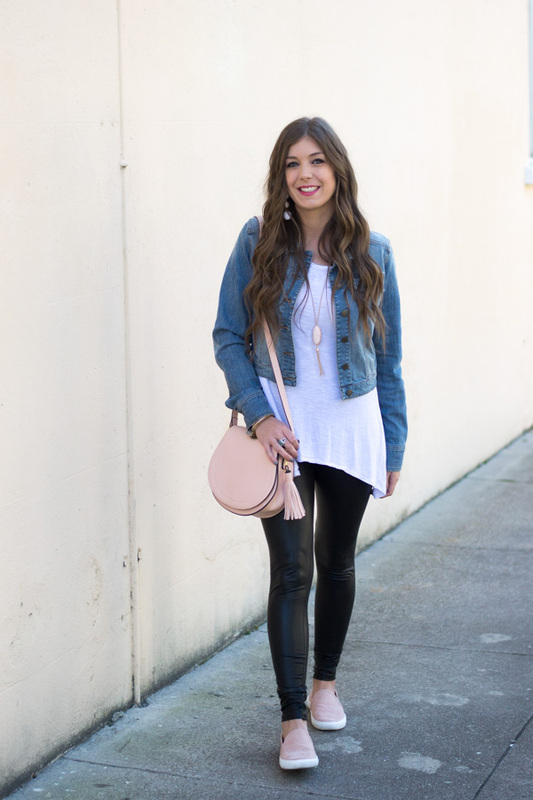 It's a good thing that there are some super easy tips to follow in order to style your faux leather leggings for spring! Spring is definitely the time for pastel colors, but it's still okay to slide a little black in there! 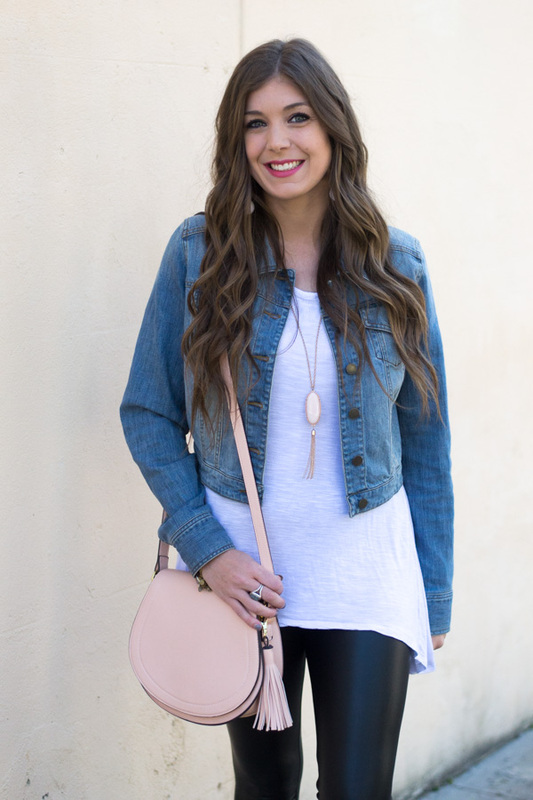 Adding pops of color (like I did here with my purse and shoes) softens your faux leather leggings, and gives your outfit a more spring-like feel! During the winter time, I'm usually wearing my faux leather leggings with heels, dressing them up! But in the spring, you definitely want to dress them down a little bit! Here I paired my faux leather leggings with a white tee and a pair of slip on sneakers. I also think they would be really cute with a pair of converses! Like I mentioned with camo, pairing a jean jacket with your faux leather leggings will instantly make your outfit spring ready! 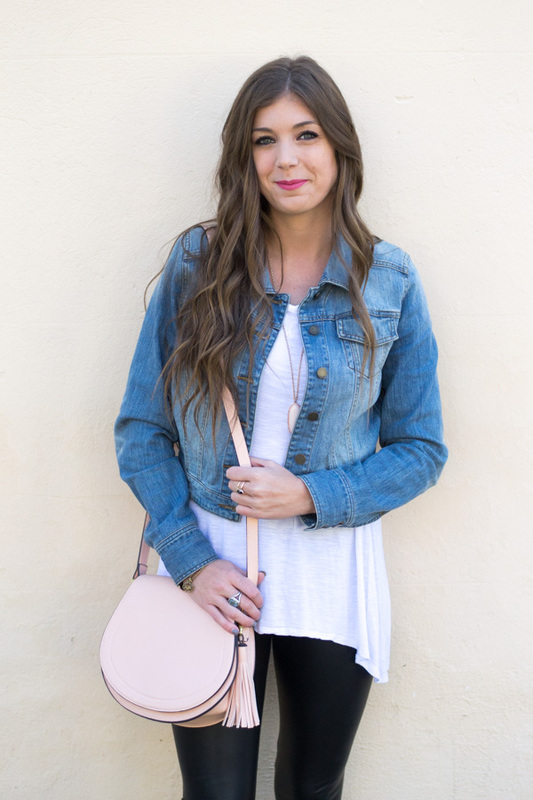 It is my go-to jacket for spring because it looks cute with almost every single outfit and gives it an almost relaxed look! There's only a few days left to enter the $1,000 Target gift card giveaway! Scroll to the bottom of this post for your chance to win! Good luck! 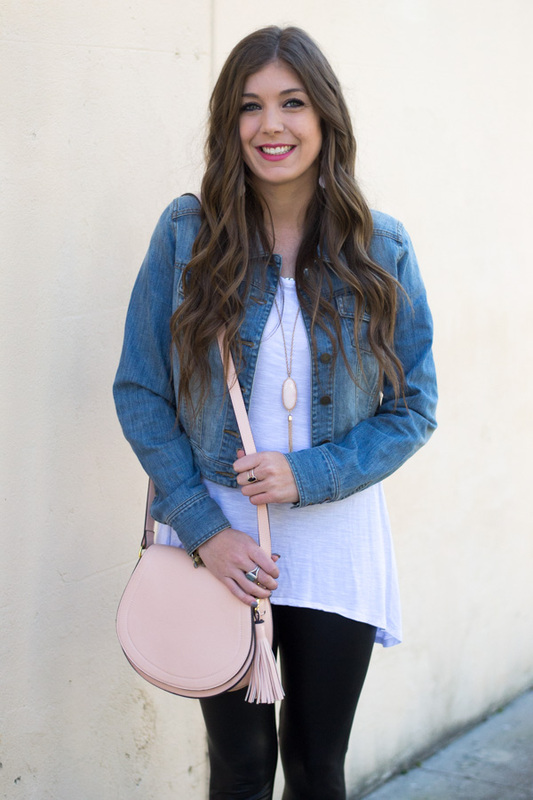 This is the PERFECT way to style faux leather leggings. I'm wanting to grab a pair soon. Love the casual look! Okay, this outfit is so cute!!!! I loved everything you paired with it. (Especially that bag! Have a great weekend babe! I love those sneakers! And you styled these leggings perfectly. These leggings are so popular and they look so good! I love it! Such great tips! I haven't put away my leather leggings either. You look gorgeous as always babe! love how the leggings add edginess to your look! 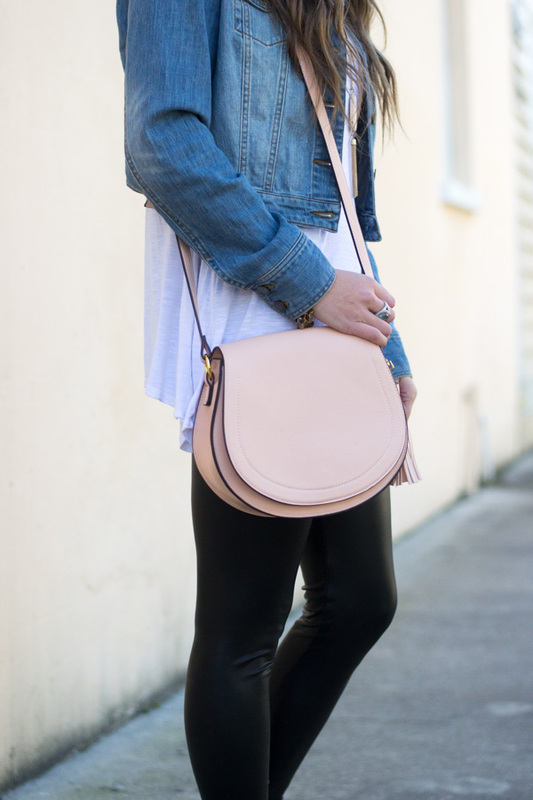 This is such a cute way to wear leather leggings in spring! The idea of dressing them down makes them work perfectly! I never thought of wearing leather leggings in the spring. You styled these perfectly. Seriously tho...there's nothing better than faux leggings! I love a good pair of faux leather pants! I can't wait to wear them again in the fall and winter once I'm no longer pregnant! Love the leggings and how you styled them! I have those leather leggings and wear them allll of the time!! love them! This outfit is right up my alley! 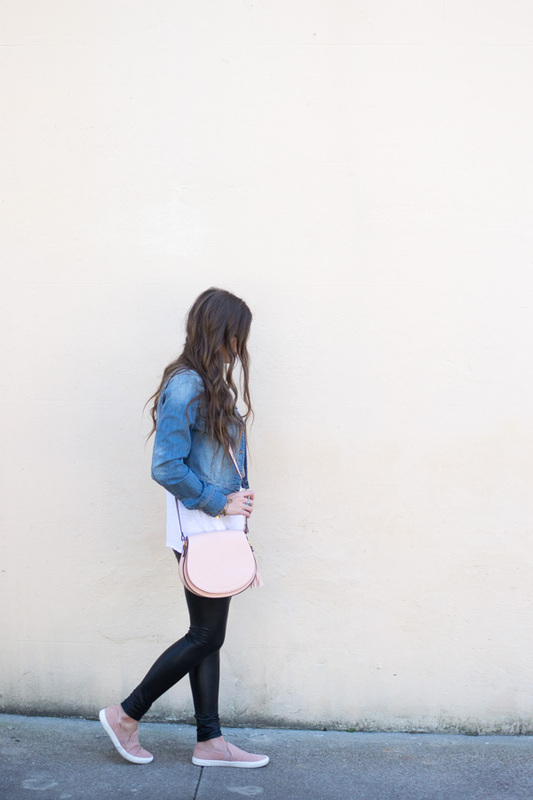 LOVE the blush pink bag and slip ons.... sooo cute with the leggings!